The South of Pier Oceanfront Virginia Beach Rentals Descriptions + some "Resort reviews" and Price Comparison & Info Links are below. We think the South end of Virginia Beach is a great Virginia Beach Vacation location - usually less crowds and evening band noise than near the Pier, plus near the south end Rudee Inlet so can watch boats coming and going from your Oceanfront Condo Balcony - also near some good Ocean Front restaurants which we have "reviewed" on a page here! - South of Pier Oceanfront Virginia Beach Rental Resort Rental Descriptions & "Reviews" are below. Near the Beach Virginia Beach Rental Condos page - possible discounts and affordable " cheap " vacation rentals approximately a block from the beach - not Ocean Front, but good discount deals on Virginia Beach rentals are often available. The following is a listing of the "South of the Pier" Oceanfront Virginia Beach Rentals / Condos in Resorts which are listed with Resort Condominiums International (RCI) or Interval International (II) Timeshare Exchange Companies. At some Virginia beaches area Resorts they also run a regular Hotel type operation for Virginia Beach condo rentals. All offer Rentals -- many very affordable. You do NOT have to be a timeshare owner to take advantage of these often very affordable Virginia Beach vacation condo rentals - sometimes at great discounts! Tip Don't overlook the often very reasonably priced (sometimes even "cheap") Beach Vacation Rental option of a Time Share Condo Rental through the Vacation Time Share Resort. Share your own Virginia Beach Vacation Rental, Exchange, or Owner User Comments at blue Info Box below. + See the Vacation Resort "Raves and Rants" or "Reviews" Other Site Viewers have shared. Time share condo rentals are usually very affordably priced -- sometimes even " cheap " -- vacation timeshare weeks that owners who are not using them that year have placed for Rent through the Timeshare resort or resort management company. Sometimes you can even find a "cheap" discount deal that was really worth your time to "dig" a bit at links below to find! These Virginia Beach Resort Condos are available for Vacation Time share exchanges by RCI or II Timeshare members, and most also have Affordable Oceanfront Virginia Beach Rentals available for rent by the week and in many cases by the day - for BOTH Time share owners and non-owners. Tip If you are checking on Resorts not listed here, note that Atlantic Avenue is the Street that runs along the length of Virginia Beach - about a block off of the ocean and beach - in front (west) of the Resorts which are next to the Ocean. Odd street numbers on Atlantic Avenue are Ocean Front. Even (eg. "600 Atlantic Ave.") street numbers are on west side of Atlantic Avenue and are really stretching it to say "Ocean View" since they are slightly over a block away from the ocean and generally have oceanfront resorts between them and the ocean. They do generally have easy access to the Beach and Boardwalk, however. See our Near the Beach Virginia Beach rental condos page for more on generally slightly less expensive Virginia Beach Rentals. You may even find a " cheap " Virginia Beach Hotel rental reviewed. Only Resorts which are right on the ocean front of Virginia Beach and the Virginia Beach Boardwalk are listed below in our Oceanfront Virginia Beach Rentals and VA Time Share Exchanges list. Add a few cheap vacation days to your Virginia Vacation! Find a "cheap" or highly discounted Getaway mini-Vacation Lodging Package on our Timeshare Vacation Promotions page. Or see our Almost " Free " Time Share Vacations - Getaways with a Time Share Resort Tour "price" + what to expect and how to find the discounted Top Getaway deals. Near the Beach Virginia Beach Rental Condos - Affordable " Cheaper " Vacation Resort Deals Page - often can find some good discounts here on close, but not "on" the beach "cheap" Virginia Beach rentals. (757) 422-3186. II affiliated Oceanfront Resort. Has Rental Packages for as little as one night available. Very reasonably priced Oceanfront Virginia Beach Rentals at the Clarion. We stayed here for a week Timeshare II exchange. The Units have been "reworked" into Condo apartments from a prior hotel by in most cases just combining and remodling adjacent hotel rooms/baths. This Limits Room sizes and layouts, but usually results in lower prices -- both for Timeshare Week purchases and for Virginia Beach Rentals. The Condo Units were clean and well maintained. Staff was very courteous and prompt to fix any problems. (We had new microwave to fix an ailing one in less than an hour.) They were replacing carpet and some furniture in many if not all of the units while we stayed there in June of 2004. Main Resort Condo drawback was that due to conversion from hotel rooms, the condo units were fairly small. The one bedroom "Captains Suite" we had could sleep six with 2 double beds in the bedroom and a pull out couch/bed in the Living Room/Kitchen area, but we felt the unit would be crowded with more than 2 adults. Tip If you are traveling with more than 2 people, go for one of their 2 bedroom units. We would stay there again if it was just the two of us, (The South end of Virginia Beach is a great location!) but our choice next time may be the relatively new beachfront "Villas at the Boardwalk" II Resort about 11 blocks north near the Pier. (see below.) This link takes you to the Interval International (II) Beach Quarters at the Clarion Resort pictures and Amenities listing page - User Reviews page Info below. Read Candid User Reviews and get over 115 Virginia Beach Resorts and Hotels ranked by popularity with comparison pricing at: Find the best deal, compare prices, and read what other travelers have to say at TripAdvisor -- You can look for Rental Deals and User Reviews on Virginia Beach Hotels and Resorts + B & B's and Beachfront Vacation Condo Rentals + some not on the ocean beach and boardwalk. You may even find a "cheap" Virginia Beach vacation rentals Hotel. Oceanfront and non oceanfront listings are shown. Click on the "B & B/Inns" Tab on the above page for User Ratings and comparison prices of 5 Virginia beach area Bed & Breakfast's + Inns. Click here to go to Google Satellite Image and Map of Beachfront Beach Quarters Resort - Clarion, Virginia Beach near Rudee Inlet with street map superimposed over the Satellite Image. Tips - Enlarge window above link opens into to a full window and then "refresh" page if needed for full size image view with more details. To re-center Map View - double-click map on desired center point. Can easily move view or zoom in or out with buttons on image page or use the arrows on your keyboard for more precise control. Click Resort Name left to jump direct to that location on the Satellite Map. "Local" Satellite Maps can be very useful - fun to zoom in on detailed image! We will try for an II exchange to the Villas at the Boardwalk Resort on next trip to Virginia Beach -- unless the new II Ocean Beach Club (below) is done by then in which case we might try to check it out. Check out the Villas at the Boardwalk as an Oceanfront Virginia Beach Time Share Rental option. -- or go to to Your Resort Raves, Rants, or Reviews blue Info Box below. Had a Virginia Beach Vacation Resort Rental or Exchange experience you'd like to share with our Site Viewers? Share your Oceanfront Virginia Beach Condo User Review on this Resort User Reviews page + See Resort "Raves, Rants, or Reviews" others have already posted on above page. Share your own Virginia Beach Vacation Rental, Exchange, or Owner User Comments here or at Blue Info Box below. RCI affiliated Oceanfront Resort. All 1 Bedroom units that have maximum of 4 occupancy. Bedrooms have king size beds plus a queen size sleeper sofa in LR. RCI Affiliated Oceanfront Resort. All 2 Bedroom Units (Maximum Occupancy 6 / Privacy Occupancy 6) Rental rates seem a bit high compared to other Oceanfront Virginia Beach Rental Condos listed here. To "North End" Oceanfront Virginia Beach Vacation Rentals page - Resorts North of the Virginia Beach Pier nearer the new North End Ocean Beach Club Resort complex. Near the Beach - Virginia Beach rental condos page - Resorts 1 to 2 blocks from the ocean beach - for usually slightly less expensive & affordable (aka. "cheap") Virginia Beach Condo Rentals. "Rave," "Rant," or User Comments? -- or a Resort User Review? Share or Tell our Site Visitors about it! Join the other Oceanfront Vacation Condo "Raves, Rants, and Reviews"
II unfortunately does not list the Resort Web Site URL for the oceanfront Virginia Beach Resorts, (II lists them for Cocoa Beach?) so you will have to check out their current availability as prospective Virginia Beach Condo Rentals by calling the Resort. When you check individual resort "Amenities" you will notice that both the Atrium and Turtle Cay are not beach front Resorts and show the Beach under "Amenities" as "Nearby" Vs "On-Site." Go directly to a Resort Condomonium International (RCI) Resort Directory selection page where you can check out RCI Virginia Beach Resorts -- most of which are Beachfront. Tip Notice that a link to the RCI Directory resort description and pictures is available, as well as the direct link to the Resort Web site so you can easily check on their availability and pricing of Ocean Front Virginia Beach Rental Condos. Note that both the Ocean Key and the Atrium Resort are not on the "Ocean" side of Atlantic Avenue and both show the Beach as "Nearby" Vs in their "On Site Amenities" list. 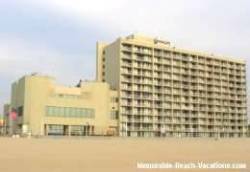 To "North End" Oceanfront Virginia Beach Vacation Rentals page - Vacation Condo Resorts and Virginia Beach Rentals North of the Virginia Beach Pier nearer the new North End Ocean Beach Club Resort complex. Vacation Packages in Virginia Beach - Discounted and Cheap Virginia Beach Vacation Packages - Virginia Beach and nearby SE Virginia Attractions - Listing. Virginia Beach Hotels Cheap - Discounted Virginia Beach Hotel Cheap options + Cheap Beachfront and near beach Virginia Beach Hotels. Please send us any Affordable Beach Front Virginia Beach rentals & Oceanfront Condo tips or good "cheap" Virginia Beach travel discount or rental web sites which you have discovered that are not mentioned here. Your Top Picks for Virginia Beach Condo Rentals would be of interest to our "viewers." Send to us on our Your Top Picks & Comments Page. -- or better yet, on the "Rave, Rant, and Resort User Comments" page above. Thanks! Attached photos to go with your comments are always interesting to all! Send your Virginia Attractions and Virginia Beach Favorites to us on our Top Picks & Comments Page Thanks! Please let us know if we can credit you with your First name and town, Full name and town, or other preference. - WHY Timeshares? What are the types of Time Shares? Do they REALLY save you Vacation Dollars? + II & RCI Time share exchanging Tips. Top Pick Virginia Beaches and Vacation Guide Books: - Southeast Virginia vacation beaches & Attractions Books & Guides - with With Virginia Beach Condo Rentals and Beach Front Dining Info for Virginia Beach. Looking for Something Specific? Search 2 of our Affordable US Vacation Guide Sites. + some Affordable Virginia Beach Rentals Vacation tips.